The test brings the Avangard one step closer to becoming the first deployed HGV system anywhere. On Wednesday, Russia successfully carried out the launch of a liquid-fueled intercontinental-range ballistic missile (ICBM) carrying the Avangard hypersonic glide vehicle payload. The Avangard is a modernized Russian delivery vehicle, designed to maneuver in the upper atmosphere at speeds in excess of Mach 5. The missile that carries the Avangard hypersonic glide vehicle is the UR-100NUUTKh, an ICBM-class missile. As The Diplomat reported earlier this year, Russian defense industry sources had noted that the first Russian Strategic Missile Forces regiment to operate the Avangard would oversee a test later this year. “The launch was performed by an operational unit of the Strategic Missile Forces from Dombarovsky missile deployment area against a hypothetical target at the Kura range, Kamchatka Territory,” the Kremlin noted in a statement. “Flying at hypersonic speed, the glide vehicle performed vertical and horizontal manoeuvres and hit the hypothetical target in time within the range’s combat field,” the statement added. 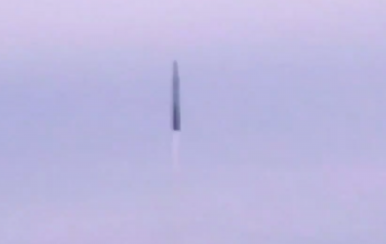 Footage of the successful test was released immediately by Russian media, showing the missile’s hot launch from a silo. The Avangard glider itself was not seen in any released footage. The missile’s payload separates after the booster’s powered flight into the exoatmosphere; after that, the hypersonic glide vehicle descends and maneuvers in the upper atmosphere to its target. Putin emphasized the Avangard’s primary purpose. “The new Avangard system is impervious to current and future air defense and missile defense systems of a potential enemy,” he noted. In March 2018, Putin announced the Avangard alongside other modernized Russian nuclear delivery systems, emphasizing that it was being pursued due to U.S. pursuit of missile defense systems. The United States’ Ground-Based Midcourse Defense missile defense system is officially designed to protect against limited threats from countries like North Korea and is not designed to negate Russia or China’s strategic deterrents. Russian statements have suggested that the Avangard will be deployed as early as 2019, making it the first operational hypersonic glide vehicle system deployed anywhere. China’s DF-17 hypersonic glide vehicle is estimated by U.S. intelligence agencies to see deployment by 2020. The Avangard is designed solely for a strategic nuclear delivery role while the DF-17 is assessed by U.S. intelligence to be capable of nuclear delivery in additional to conventional payloads. The test is the thirteenth to date to involve the experimental Burevestnik.